Saskatoon Pest Control - Full Service Exterminators - Call Us Now! Toodaloo offers expert pest control services in the Saskatoon area, helping you to keep pests and wildlife outside. There is no telling where some of these pests come from but one thing is certain - that pest removal is necessary! Instead of leaving property owners to fend for themselves against insects, rodents and even birds, our pest control specialists are dedicated to eliminating infestations. There is no one better to take care of Saskatoon homes and businesses than our highly trained and equipped technicians. Each and every service is designed with efficiency in mind and takes the least invasive approach possible. Treating tricky insects no longer means ruined walls or destroyed floors when you trust your Saskatoon pest control specialists. Dont let a rat problem take over homes and businesses in your community. Rodent control services at Toodaloo address infestations from the ground level and up to completely get rid of rats. Rigorous training processes help treat specific types of rat to create custom rodent control services for you. Turn your mouse problem into no problem with Toodaloo. Proper mouse control is more than just getting rid of mice. Once mice are gone, Toodaloo technicians educate our clients as to deal with mouse droppings and how to prevent these rodents from coming back. Protect yourself from bed bug infestations with professional pest control services. Bed bug control involves steam cleaners, heat treatment, and pest management after-care. Ditch the bites, without throwing out furniture, or a mattress and box spring. Both chemical and non-chemical treatment options are available for your home or commercial property. Don't let termite colonies eat you out of house and home! You might not be able to prevent termites from entering your property but you can kick them out with out with a professional pest control service. Treatment methods include tracking satellite colonies, assessing damage and monitoring migration patterns. Take the bite out of carpenter ant infestations with help from pest control professionals. Our Toodaloo technicians track and treat pests using imaging tools and injection rods to get rid of both carpenter ants and satellite colonies. It has never been easier to get rid of pavement ants crawling around your property. Pavement ant control might seem like a never ending chore but expert tools and techniques can get the job done once and for all. By tracking worker ants through wall voids and tough spots, insect populations are treated completely with no pest left behind. Wasps shouldn't send you running around your property. Show these pests the door with one call to our Toodaloo technicians. Getting rid of wasps and their nests can be a dangerous game, but our experts use protective clothing and tools as part of our pest control methods. All of the preventative measures in the world can\'t keep silverfish out, but our technicians can! Pest control experts treat cracks and crevices to get rid of silverfish completely. A silverfish infestation is notoriously hard to get rid of, so our specialists work with clients to create an uninviting space for pests and work toward repelling silverfish. Pigeon removal and control is no picnic - until you have specialty systems designed to keep these birds from landing. Instead of struggling with unsightly bird droppings, call Toodaloo to hear your options for managing your pigeon problem. Bird spiking, shock track and even bird netting are viable options for residential, commercial and multiunit properties. Kick roach populations out of kitchens and bathrooms with specialized pest control. Toodaloo technicians track entry points and identify food and water sources that might be drawing pests in. Long term solutions to roach control involves more than using basic bait stations, so call Toodaloo for your assessment, treatment and aftercare needs. Flea removal is a nightmare for any pet owner. Don't bother with flea collars when Toodaloo gets professional results for both removal and flea prevention. Our experts ditch these pests at every level with specialized pest control that targets flea eggs, adolescents and adults all at once! Don\'t let spiders have the run of your home or workspace. These intruders are sneaky but they are no match for our dedicated Toodaloo technicians. Pest control experts use specialty tools to get rid of every last web, leg and egg sac. While major companies are focused on headline pests like mice or bed bugs, a much larger rodent is creeping into properties. They might be more appealing than the average pest, but squirrels are messy and cause a lot of damage. Nestled within the prairie grasslands, Saskatoon is home to many people, but also a sampling of the local wildlife and other, smaller critters. As Saskatchewan’s largest city. it should come as no surprise that wildlife control and pest removal are in high demand. When you begin to notice uninvited guests scurrying around your home or workspace, it is time to call Toodaloo. The experienced removal specialists at Toodaloo are your answer to long-term integrated pest management. Whether large or small, any sort of insect or rodent is bad news for your property. While bugs are not picky about their living environment – you should be! There is never a bad time to enlist a professional service for your Saskatoon pest control. There are no redeeming qualities to having pests posted up in your living space. While it is easy to see that they are bad for your property, proper extermination is harder to see clearly. There are many ins-and-outs to proper removal that basic traps and poisons can’t cover. In order to be effective, proper extermination techniques cover both seen and unseen areas of your home or workspace. Spotting larger rodents, like rats or mice might seem easy enough, but keen eyes are necessary for those trickier intruders. Bed bugs, fleas and silverfish are prime examples of those unseen insects that wreak havoc on properties. These pests ingrain themselves into difficult areas, hunkering down and spreading populations all over your home. Trying your hand at ineffective removal practices only prolongs the time that you have to spend with these tiny terrors. When you choose a professional pest control company, like Toodaloo, you can rest assured that services are fast, safe, professional and completely insured. At Toodaloo, damage control is the name of the game, operating safely to ensure no unnecessary issues arise for our staff or your property. 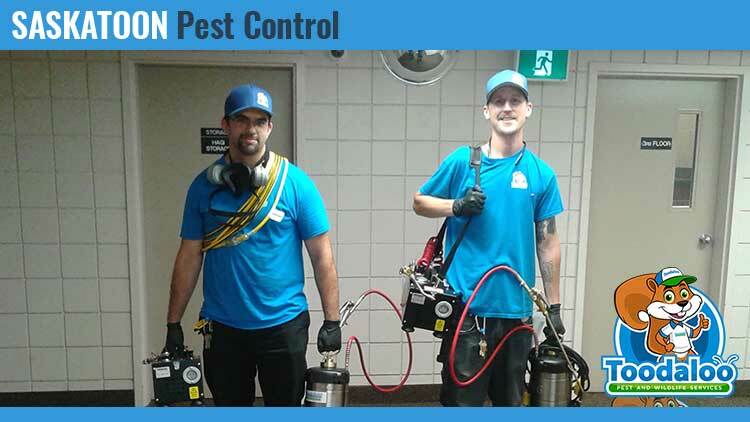 With local technicians behind every service, our pest control experts understand the needs of our communities and are invested in the outcomes of each Saskatoon pest removal. Locally owned and operated companies mean that you won’t be left waiting for relief of your insect and rodent woes. Let’s face it: no one likes having vermin in their building. Even the most passionate animal lover does not want to be sharing a living space with rats, mice or even ants! It is with this in mind that Toodaloo has created a full-service plan for your integrated pest management. When you choose Toodaloo, you are getting a treatment plan that not only eliminates your infestation, but one that plans for the future. Prevention and aftercare techniques are just as important for results as the treatment itself. Letting our professionals address problem entry points around your property means the difference between kicking insects and vermin out and keeping them out. This full-service approach to in the Saskatoon area, sets our specialists apart from the pack. Instead of learning to live with invasive species, have our Toodaloo technicians keep your home or business free of vermin, rodents, and bugs!